So now we’ve made a number of amazing Python programs that transform and generate text. But all of our programs run from the command-line. Wouldn’t it be nice if there were some way to make these programs more widely available? Wouldn’t it be nice if people could use our programs through, say, the World Wide Web? Fortunately such a thing is possible. We can write a web application that provides an interface between our text generation code and human users with web browsers. And it’s easier than you think! Any computer on the Internet is capable of opening a network connection to another. For our purposes, you can think of these network connections as kind of like UNIX standard input and standard output: one computer (the “client”) opens a connection to another computer (the “server”). The client sends bytes to the server, and the server responds with bytes of its own. A single “server” can have multiple programs running on it that respond to network connections. Such programs distinguish themselves from one another by listening to network connections on different “ports.” So for example, the program on a server that responds to network connections related to sending e-mail might listen for connections on port 25, while the program that responds to connections related to database services might listen on port 27017. In this chapter, we’ll write programs that listen for network connections, and we’ll need to select a port for the programs to listen to. We’ll need to select a port that isn’t already in use by another program. Some port numbers are associated by convention with particular services. Notably, port 80 is considered the “default” port for communicating with server programs that serve web pages. There are hundreds of protocols in use on the Internet. As you’re reading this, your computer is likely using dozens of them simultaneously to communicate with other computers on the Internet (or between programs on your own computer). There’s a protocol for sending mail, a protocol for looking up domain names, a protocol for peer-to-peer file sharing and more. This is the HTTP response. This is what the server sends to the client in response to its request. Let’s talk a bit about the specific structure of both response and request. I’ll point out these parts using the request we just made with netcat. This request has no body. A body is sent with a request only when the request is doing something like submitting data from a form, or uploading a file. In fact, you can’t send a body with a GET request at all; bodies are only supported for POST and PUT requests. GET: Client wants the server to return the content of the resource named in the path. PUT: Client wants to modify the contents of the resource named in the path, or create a new resource with the given path. POST: Client wants to add to or modify the resource. DELETE: Client wants to remove the resource. HEAD: Client wants to check to see whether or not the resource exists, and maybe get metadata about the resource, without necessarily fetching the contents of the resource. OPTIONS: Client wants to know which of the above methods are supported for the given resource. As you can see, the meanings of these verbs overlap in strange ways (e.g., it’s not clear what the difference between POST and PUT is, since both are used to add and modify resources). Every web service uses these verbs slightly differently, and when you implement a web service, you need to make decisions about what the verbs “mean.” It’s best to stick to convention, but there’s nothing stopping you from making your application accept GET requests that delete resources, or POST requests that return resources instead of modifying them. Most web applications make use only of the verbs GET and POST. This is because most web browsers only support those two methods (though with the advent of HTML5, the situation is changing). Even today, if you’re developing a web application—especially one that’s designed for browsers, and not necessarily for automated agents—you’re safe making your service only support GET and POST. This is the response. The response consists of the status line, a series of one or more headers, and then the body of the response. The status line has the HTTP version and a number that indicates the status of the request—this is the so-called HTTP “status code.” 200 means “okay, here’s your data”; 404 means “I couldn’t find the resource you wanted.” There are dozens of other codes with various meanings and conventional uses. The headers tell us information about the response, such as how many bytes are in it (the Content-Length header), what kind of document it is (the Content-Type header), and when the document was last modified (the Last-Modified header). Some of the headers are required; some are optional. The client needs to know this information so that it can properly download the data and display it to the user. After the headers, we see the response body. The response body is simply the data contained in the resource that the client requested. On the web, response bodies are usually HTML documents, but they can also be other things, like images, PDFs, MP3s, etc. Web APIs generally return JSON documents, not HTML. We’ve already discussed in this class how to make web requests. You could just type in all your web requests by hand, but it’s easier to have an application (like a web browser, or curl) or a library (like urllib) do it for you. These tools abstract away all the work of formatting the request correctly, including the right headers, etc. so you can just get your work done. It’s the same situation with writing a web server—a program that receives web requests and then respond to them. You could write a program that listens on the network for incoming connections, parses HTTP requests according to the HTTP standard, then sends responses in the correct format. But that would be a hassle! It turns out that enterprising programmers have already done that work for us—the work of making a program that listens for HTTP requests and responds to them. That work takes the form of a web framework—a kind of “skeleton” for a web server that has all the difficult stuff already taken care of. The framework gives you access to everything in the HTTP request in a clean, abstrated way: the path of the request, the HTTP method, the body of the request, any headers, and the query string. Your job is to write rules and code that specify what should happen when requests are received. What should the response code be? What should the response body look like? And so forth. Web frameworks also commonly supply functionality to make writing web applications easier, such as HTML template rendering and database connection abstraction. Django: a full-featured “full stack” web framework. Robust but complex. Tornado: a barebones web framework that uses asynchronous I/O for extreme scalability. Bottle: a fast and simple “microframework” with no external dependencies. Today we’re going to use a framework called Flask. I chose Flask because it’s easy to get started with, but has a clear path for making more advanced web applications when you’re ready to take off the training wheels. There’s also an active developer community producing helpful Flask extensions and extensive, beginner-friendly documentation. In particular, we’re going to use Flask to take the text manipulation and text generation projects that we’ve made so far and turn them into simple web applications. In the process, we’re just going to scratch the surface of what’s possible with Flask, but hopefully it’ll be enough to whet your appetite and help you understand the basic concepts. Hey, great! We’ve made a simple “Hello, world” application. When you’re done basking in the glory of being a back-end Python web developer, you can hit Ctrl-C in the window where you ran the Flask application in order to stop the web server. Let’s go down this example line by line. These lines import the Flask class from the flask module and import the random module as well. (You don’t need to import random in order to use Flask, but we’re using it as part of our application logic later in the program.) The variable app will contain a Flask application object. These lines create some lists of strings that we’re going to use in our web application. These lines define a function called hello. This function selects random items from the greets and places lists, and then returns the resulting string. What makes this function special is the line right above its definition: @app.route('/hello'). This is a special “decorator” that tells Flask to run this function whenever the application gets a request to the path /hello. The main work of writing a Flask application is defining functions and then associating them with paths to run when a particular path is in the HTTP request. You can write as many functions that respond to as many paths as you want. “Decorator” is the real, actual name for that funny line beginning with @. You don’t need to understand decorators in great detail in order to use Flask—you can just think of them as a funny bit of syntax that you have to put before a function definition in order to let Flask know what the function is for and when it should be called. But if you’re interested, here’s a good tutorial about decorators, what they’re good for, and how to make your own. The app.run() method starts the Flask application, which then runs forever, eagerly waiting for incoming web requests. return "no rhymes found :(\n"
Oh gross. It looks like the application is returning an awful error message. How we can we get around this and display something nicer? One possibility is to use the dictionary object’s get method, which attempts to fetch the value of a key but resorts to a default if the key isn’t found. Here’s a version of plural.py with such a solution in place. This would work, but it’s a little ungainly and inconvenient. For one, the HTML is inside the code, so you have to modify the Python file if you want to tweak the way that the application looks. It’s often the case that separate members of the team developing a web applications will work on different parts: one person will work on the Python code, while another will work on the HTML front-end. 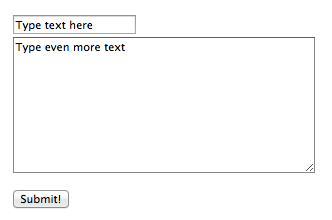 For both of these reasons, it’s convenient to separate out the HTML content in a separate file. Flask (as with other web frameworks) offers this functionality in the form of templates. A template is basically an HTML file that has a bit of extra syntax in it able to include data from the Python application in the HTML output. Templates live in separate files, so they can be edited apart from the Python code. Let’s make a version of our greeting generator that uses templates. The Python code looks mostly the same, with a few additions, which I will discuss below. Then, instead of returning a string literal in our handler function, we instead call render_template. This function takes a filename as its first argument, which specifies which template file to use. (It looks for template files in a subdirectory called templates.) You can then give the function any number of keyword parameters. It reads in the template file as a string. Whenever it encounters `` (where name can be any Python variable name) in the contents of the template, it performs a replacement, inserting instead the value for the keyword argument name as passed to the function. It returns the contents of the template file with those transformations applied. Simple variable replacement like this will get you a long way in web development. But Flask’s templating engine, Jinja2, supports much more sophisticated functionality—worth checking out if you want to build a non-toy web application with Flask. The key to understanding HTML forms is this: they instruct the browser on how to make a request to your application—specifically, how to send the information in the form to your web application when the user clicks “Submit.” The attributes of the <form> tag are key: the action attribute indicates what path the browser should make a request to; the method attribute indicates what HTTP method the browser should use. When the user clicks Submit, the information in the form will be sent to your application, with the name attributes of each form element specifying the keys and whatever the user types in for those fields as the values. To make an application that uses an HTML form, we need to have two handler functions. One to display the page that shows the form, and another to respond to the request that the browser will do when the user clicks Submit on the form. Here’s a simple web application that does this. Whatever the user types in the form will be parsed into words and replaced at random with words that rhyme. Making a simple web API with Flask is easy. Use the jsonify() function from the Flask library to return the results in JSON format. RESTful Web APIs by Leonard Richardson and Mike Amundsen is the book to read about HTTP.